The RS-5 from Sparco is a two colour design race suit made from fabrics which offer both a light weight suit and breathability (average weight of 330/360 gr/m²). They feature floating sleeves with pre-formed arms and a stretch panel on the back. This offers increased driver comfort and fit. They also have a zip pull at both the neck and waist. Includes FREE Sparco Suit Bag. 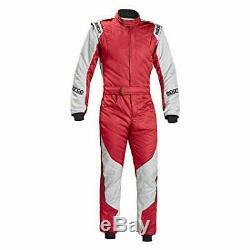 The item "Sparco Energy RS-5 Race Suit FIA Race Rally Sprint Overalls red 66" is in sale since Monday, February 11, 2019. This item is in the category "Vehicle Parts & Accessories\Clothing, Helmets & Protection\Car & Kart Racewear\Race Suits". The seller is "zxr400er" and is located in Portsmouth. This item can be shipped to United Kingdom.